This article is about underwater sound propagation. For atmospheric sounding, see SODAR. For other uses, see Sonar (disambiguation). 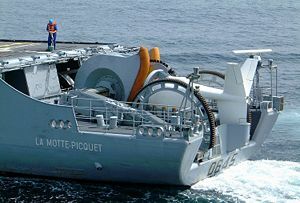 French F70 type frigates (here, La Motte-Picquet) are fitted with VDS (Variable Depth Sonar) type DUBV43 or DUBV43C towed sonars. SONAR (SOund Navigation And Ranging) — or sonar — is a technique that uses sound propagation under water (primarily) to navigate, communicate, or detect other vessels. The term sonar is also used for the equipment used to generate and receive the sound. The study of underwater sound is known as underwater acoustics or sometimes hydroacoustics. There are two kinds of sonar — active and passive. The frequencies used in sonar systems vary from infrasonic to ultrasonic. Sonar may be used as a means of acoustic location. Sonar may also be used in air for robot navigation. SODAR—which is an upward-looking, in-air sonar—is used for atmospheric investigations. Acoustic location in air was used before radar. Although some animals have probably used sound for communication and object detection for millions of years, the use by humans is first recorded by Leonardo Da Vinci in 1490. A tube inserted into the water was said to be used to detect vessels by placing an ear to the tube. In the nineteenth century, an underwater bell was used as an ancillary to lighthouses to provide warning of hazards. A number of Internet sources credit shipbuilder Lewis Nixon with inventing an underwater listening device for detecting icebergs in 1906 . However, there is no mention of his work in Hackmann's historical account of sonar. The use of sound to 'echo locate' underwater in the same way as bats use sound for aerial navigation seems to have been prompted by the Titanic disaster of 1912. The world's first patent for an underwater echo ranging device was filed at the British Patent Office by English meteorologist Lewis Richardson, one month after the sinking of the Titanic, and a German physicist Alexander Behm obtained a patent for an echo sounder in 1913. Canadian Reginald Fessenden built an experimental system in 1914 which could detect an iceberg at two miles range, though it was unable to say which direction the berg was in. The ten Montreal-built British H class submarines launched in 1915 were equipped with a Fessenden transducer. During World War I, with the need to detect submarines, more research into the use of sound was undertaken. The British made early use of underwater hydrophones, while the French physicist Paul Langevin, working with a Russian émigré electrical engineer, Constantin Chilowski, worked on the development of active sound devices for detecting submarines in 1915. Although piezoelectric and magnetostrictive transducers later superseded the electrostatic transducers they used, this work influenced the future of detection designs. Although modern transducers often use a composite material as the active part between a light head and a heavy tail, many other designs have been developed. For example, lightweight sound sensitive plastic film and fiber optics have been used for hydrophones (acousto-electric transducers for in-water use), while Terfenol-D and PMN (lead magnesium niobate) have been developed for projectors. Piezoelectric composite materials are available from several manufacturers including Morgan Electro Ceramics. In 1916, under the British Board of Invention and Research, Canadian physicist Robert Boyle took on the active sonar project with A B Wood, producing a prototype for testing in mid-1917. This work, for the Anti-Submarine Division, was undertaken in utmost secrecy, and used quartz piezoelectric crystals to produce the world's first practical underwater active sound detection apparatus. To maintain secrecy no mention of sound experimentation or quartz was made - the word used to describe the early work ('supersonics') was changed to 'ASD'ics, and the quartz material 'ASD'ivite. From this came the British acronym ASDIC. In 1939, in response to a question from the Oxford English Dictionary, the Admiralty made up the story that the letters stood for 'Anti-Submarine Detection Investigation Committee', and this is still widely believed, though no committee bearing this name has ever been found in the Admiralty archives. By 1918, both the U.S. and Britain had built active systems, though the British were well in advance of the US. They tested their ASDIC on HMS Antrim in 1920, and started production of units in 1922. The 6th Destroyer Flotilla had ASDIC-equipped vessels in 1923. An anti-submarine school, HMS Osprey, and a training flotilla of four vessels were established on Portland in 1924. The U.S. Sonar QB set arrived in 1931. By the outbreak of World War II, the Royal Navy had five sets for different surface ship classes, and others for submarines, incorporated into a complete anti-submarine attack system. The effectiveness of early ASDIC was limited by the use of the depth charge as an anti-submarine weapon. This required an attacking vessel to pass over a submerged contact before dropping charges over the stern, resulting in a loss of sonar contact in the moments prior to attack. The hunter was effectively firing blind, during which time a submarine commander was able to take successful avoiding actions. This situation was remedied by used of several ships cooperating together and by the adoption of "ahead throwing weapons," such as Hedgehog and later Squid, which projected warheads at a target ahead of the attacker and thus still in ASDIC contact. Developments during the war resulted in British ASDIC sets which used several different shapes of beam, enabling blind spots to be continuously covered. Later, acoustic torpedoes were used. At the start of WWII British sonar technology was transferred to the US. Research on sonar and underwater sound was expanded greatly, particularly in the US. Many new types of military sonar were developed. These included sonobuoys, dipping/dunking sonar and mine detection sonar. This work formed the basis for post war developments related to countering the nuclear submarine. Work on sonar had also been carried out in many other counties, notably in Germany. This included countermeasures. At the end of WWII this German work was assimilated by Britain and the US. Sonars have continued to be developed by many countries, including Russia, for both military and civil uses. In recent years the major military development has been the increasing interest in low frequency active systems. In World War II, the Americans used the term SONAR for their systems, coined as the equivalent of RADAR. In 1948, with the formation of NATO, standardization of signals led to the dropping of ASDIC in favor of sonar. The detection, classification and localization performance of a sonar depends on the environment and the receiving equipment, as well as the transmitting equipment in an active sonar or the target radiated noise in a passive sonar. 4388 + (11.25 × temperature (in °F)) + (0.0182 × depth (in feet) + salinity (in parts-per-thousand)). This is an empirically derived approximation equation that is reasonably accurate for normal temperatures, concentrations of salinity and the range of most ocean depths. Ocean temperature varies with depth, but at between 30 and 100 meters there is often a marked change, called the thermocline, dividing the warmer surface water from the cold, still waters that make up the rest of the ocean. This can frustrate sonar, for a sound originating on one side of the thermocline tends to be bent, or refracted, through the thermocline. The thermocline may be present in shallower coastal waters. However, wave action will often mix the water column and eliminate the thermocline. Water pressure also affects sound propagation. Increased pressure increases the sound speed, which causes the sound waves to refract away from the area of higher sound speed. The mathematical model of refraction is called Snell's law. Sound waves that are radiated down into the ocean bend back up to the surface in great arcs due to the increasing pressure (and hence sound speed) with depth. The ocean must be at least 6000 feet (1850 meters) deep, or the sound waves will echo off the bottom instead of refracting back upwards, and the loss at the bottom reduces performance. Under the right conditions these sound waves will then be focused near the surface and refracted back down and repeat another arc. Each focus at the surface is called a convergence zone (CZ). This CZ forms an annulus about the sonar. The distance and width of the CZ depends on the temperature and salinity of the water. In the North Atlantic, for example, CZs are found approximately every 33 nautical miles (61 km), depending on the season. Sounds that can be heard from only a few miles in a direct line can therefore also be detected hundreds of miles away. With powerful sonars the first, second and third CZ are fairly useful; further out than that the signal is too weak, and thermal conditions are too unstable, reducing the reliability of the signals. The signal is naturally attenuated by distance, but modern sonar systems are very sensitive, i.e. can detect despite low signal-to-noise ratios. If the sound source is deep and the conditions are right, propagation may occur in the 'deep sound channel'. This provides extremely low propagation loss to a receiver in the channel. This is because of sound trapping in the channel with no losses at the boundaries. Similar propagation can occur in the 'surface duct' under suitable conditions. However in this case there are reflection losses at the surface. Sound propagation is also affected by absorption in the water itself as well as at the surface and bottom. This absorption is frequency dependent, with several different mechanisms in sea water. Thus sonars required to operate over long ranges tend to utilize low frequencies to minimize absorption effects. The sea contains many sources of noise that interfere with the desired target echo or signature. The main noise sources are due to waves and shipping. The motion of the receiver through the water can also cause low frequency noise, which is speed dependent. When active sonar is used, scattering occurs from small objects in the sea as well as from the bottom and surface. This can be a major source of interference but does not occur with passive sonar. This scattering effect is different from that in room reverberation which is a reflection phenomenon. An analogy for reverberation is the scattering of a car's headlights in fog or mist. A high-intensity pencil beam will penetrate the fog; main headlights are less directional and result in "white-out" where the returned reverberation dominates. Similarly, to overcome reverberation, an active sonar needs to transmit in a narrow beam. The target of a sonar, such as a submarine, has two main characteristics that influence the performance of the sonar. For active sonar it is its sound reflection characteristics, known as its target strength. For passive sonar the target's radiated noise characteristics are critical. The radiated spectrum in general will consist of an unresolved continuum of noise with spectral lines in it, the lines being used for classification. Echoes are also obtained from other objects in the sea such as whales, wakes, schools of fish and rocks. Active (powered) countermeasures may be launched by a submarine under attack to raise the noise level and/or provide a large false target. Passive (ie non-powered) countermeasures include mounting noise generating devices on isolating devices and coating the hull of submarines. Active sonar uses a sound transmitter and a receiver. When the two are in the same place it is monostatic operation. When the transmitter and receiver are separated it is bistatic operation. When more transmitters (or more receivers) are used, again spatially separated, it is multistatic operation. Most sonars are used monostatically with the same array often being used for transmission and reception, though when the platform is moving it may be necessary to consider a single transmitter/receiver as being operated bistatically. Active sonobuoy fields may be operated multistatically. Active sonar creates a pulse of sound, often called a "ping," and then listens for reflections (echo) of the pulse. This pulse of sound is generally created electronically using a Sonar Projector consisting of a signal generator, power amplifier and electro-acoustic transducer/array, possibly with a beamformer. However, it may be created by other means, eg chemically using explosives or by using heat sources in thermoacoustics. To measure the distance to an object, the time from transmission of a pulse to reception is measured and converted into a range by knowing the speed of sound. To measure the bearing, several hydrophones are used, and the set measures the relative arrival time to each, or with an array of hydrophones, by measuring the relative amplitude in beams formed through a process called beamforming. Use of an array reduces the spatial response so that to provide wide cover multibeam systems are used. The target signal (if present) together with noise is then passed through various forms of signal processing, which for simple sonars may be just energy measurement. It is then presented to some form of decision device that calls the output either the required signal or noise. This decision device may be an operator with headphones or a display, or in more sophisticated sonars this function may be carried out by software. Further processes may be carried out to classify the target and localize it, as well as measuring its velocity. The pulse may be at constant frequency or a chirp of changing frequency (to allow pulse compression on reception). Simple sonars generally use the former with a filter wide enough to cover possible Doppler changes due to target movement, while more complex ones generally include the latter technique. Today, pulse compression is usually achieved using digital correlation techniques. Military sonars often have multiple beams to provide all-round cover while simple ones only cover a narrow arc. Originally the latter was often scanned around mechanically but this was a slow process. 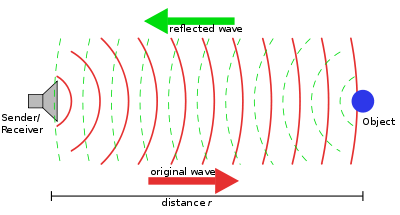 Particularly when single frequency transmissions are used, the Doppler effect may be used to measure the radial speed of a target. The difference in frequency between the transmitted and received signal is measured and converted into a velocity. Since Doppler shifts can be introduced by either receiver or target motion, allowance has to be made for the radial speed of the searching platform. One useful small sonar looks roughly like a waterproof flashlight. One points the head into the water, presses a button, and reads a distance. Another variant is a "fishfinder" that shows a small display with shoals of fish. Some civilian sonars approach active military sonars in capability, with quite exotic three-dimensional displays of the area near the boat. However, these sonars are not designed for stealth. In wartime, emission of an active pulse is so compromising for a submarine's stealth that it is considered a very severe breach of tactics. A very directional, yet low-efficiency type of sonar (used by fisheries, military, and for port security) makes use of a complex nonlinear feature of the water known as non-linear sonar, the virtual transducer being known as a parametric array. A sonar target is small relative to the sphere, centered around the emitter, on which it is located. Therefore, the power of the reflected signal is very low, several orders of magnitude less than the original signal. Even if the reflected signal was of the same power, the following example (using hypothetical values) shows the problem: Suppose a sonar system is capable of emitting a 10000 W/m2 signal at 1m, and detecting a 0.001 W/m2 signal. At 100 m the signal will be 1 W/m2 (due to the inverse-square law). If the entire signal is reflected from a 10 sq m target, it will be at 0.001 W/m2 when it reaches the emitter, i.e., just detectable. However, the original signal will remain above 0.001 W/m2 until 300 m. Any 10 sq m target between 100 and 300 m using a similar or better system would be able to detect the pulse but would not be detected by the emitter. The detectors must be very sensitive to pick up the echoes. Since the original signal is much more powerful, it can be detected many times further than twice the range of the sonar (as in the example). In active sonar there are two performance limitations, due to noise and reverberation. In general one or other of these will dominate so that the two effects can be initially considered separately. where SL is the source level, TL is the transmission loss (or propagation loss), TS is the target strength, NL is the noise level, DI is the directivity index of the array (an approximation to the array gain) and DT is the detection threshold. where RL is the reverberation level and the other factors are as before. High-powered sonar transmitters may harm marine animals, although the precise mechanisms for this are not well understood. Some marine animals, such as whales and dolphins, use echolocation systems similar to active sonar to locate predators and prey. It is feared that sonar transmitters could confuse these animals and cause them to lose their way, perhaps preventing them from feeding and mating. It has been suggested that military sonar may induce whales to panic and surface too rapidly leading to a form of decompression sickness. This was first raised by a paper published in the journal Nature in 2003. It reported acute gas-bubble lesions (indicative of decompression sickness) in whales that beached shortly after the start of a military exercise off the Canary Islands in September 2002 . In the Bahamas in 2000, a sonar trial by the United States Navy of transmitters in the frequency range 3–8 kHz at a source level of 223–235 decibels re 1 μPa (scaled to a distance of 1 m) resulted in the beaching of seventeen whales, seven of which were found dead. The Navy accepted blame in a report, which found the dead whales to have experienced acoustically-induced hemorrhages around the ears. The resulting disorientation may have led to the stranding. A kind of sonar called mid-frequency sonar has been correlated with mass cetacean strandings throughout the world's oceans, and has therefore been singled out by environmentalists as causing the death of marine mammals. A lawsuit filed by the Natural Resources Defense Council in Santa Monica, California on 20 October, 2005 contended that the U.S. Navy has conducted sonar exercises in violation of several environmental laws, including the National Environmental Policy Act, the Marine Mammal Protection Act, and the Endangered Species Act. An imitation of the humpback whale's sonar was conducted in the redirection of Humphrey the whale, who deviated from his normal migration path to enter San Francisco Bay. 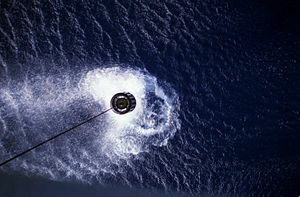 Environmental impacts of the operation of active sonar are required to be carried out by U.S. law. Procedures for minimizing the impact of sonar are developed in each case where there is significant impact. Passive sonar has a wide variety of techniques for identifying the source of a detected sound. For example, U.S. vessels usually operate 60 Hz alternating current power systems. If transformers or generators are mounted without proper vibration insulation from the hull or become flooded, the 60 Hz sound from the windings can be emitted from the submarine or ship. This can help to identify its nationality, as most European submarines have 50 Hz power systems. Intermittent sound sources (such as a wrench being dropped) may also be detectable to passive sonar. Until fairly recently, the identification of a signal was carried out by an operator using experience and training. Now computers may be utilized in this process. Passive sonar systems may have large sonic databases, however final classification is generally performed manually by the sonar operator. A computer system frequently uses these databases to identify classes of ships, actions (i.e., the speed of a ship, or the type of weapon released), and even particular ships. Publications for classification of sounds are provided by and continually updated by the U.S. Office of Naval Intelligence. where SL is the source level, TL is the transmission loss, NL is the noise level, DI is the directivity index of the array (an approximation to the array gain) and DT is the detection threshold. 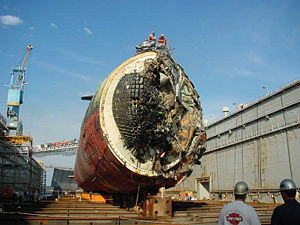 The USS San Francisco's sonar array was damaged when she ran aground. Modern naval warfare makes extensive use of sonar. The two types described before are both used, from various platforms, i.e., water-borne vessels, aircraft and fixed installations. The usefulness of active versus passive sonar depends on the radiated noise characteristics of the target, generally a submarine. Although in WWII active sonar was mainly used, except by submarines, with the advent of noisy nuclear submarines passive sonar was preferred for initial detection. As the submarines have become quieter, active operation is now more used. Active sonar is extremely useful, since it gives the exact position of an object. Active sonar works the same way as radar: a signal is emitted. The sound wave then travels in many directions from the emitting object. When it hits an object, the sound wave is then reflected in many other directions. Some of the energy will travel back to the emitting source. The echo will enable the sonar system or technician to calculate, with many factors such as the frequency, the energy of the received signal, the depth, the water temperature, etc., the position of the reflecting object. Using active sonar is somewhat hazardous however, since it does not allow the sonar to identify the target, and any vessel around the emitting sonar will detect the emission. Having heard the signal, it is easy to identify the type of sonar (usually with its frequency) and its position (with the sound wave's energy). Moreover, active sonar, similar to radar, allows the user to detect objects at a certain range but also enables other platforms to detect the active sonar at a far greater range. Since active sonar does not allow an exact identification and is very noisy, this type of detection is used by fast platforms (planes, helicopters) and by noisy platforms (most surface ships) but rarely by submarines. When active sonar is used by surface ships or submarines, it is typically activated very briefly at intermittent periods, to reduce the risk of detection by an enemy's passive sonar. As such, active sonar is normally considered a backup to passive sonar. In aircraft, active sonar is used in the form of disposable sonobuoys that are dropped in the aircraft's patrol area or in the vicinity of possible enemy sonar contacts. Passive sonar has several advantages. Most importantly, it is silent. If the target radiated noise level is high enough, it can have a greater range than active sonar, and allows an identification of the target. Since any motorized object makes some noise, it may be detected eventually. It simply depends on the amount of noise emitted and the amount of noise in the area, as well as the technology used. To simplify, passive sonar "sees" around the ship using it. On a submarine, the nose mounted passive sonar detects in directions of about 270°, centered on the ship's alignment, the hull-mounted array of about 160° on each side, and the towed array of a full 360°. The no-see areas are due to the ship's own interference. Once a signal is detected in a certain direction (which means that something makes sound in that direction, this is called broadband detection) it is possible to zoom in and analyze the signal received (narrowband analysis). This is generally done using a Fourier transform to show the different frequencies making up the sound. Since every engine makes a specific noise, it is easy to identify the object. Another use of the passive sonar is to determine the target's trajectory. This process is called Target Motion Analysis (TMA), and the resultant "solution" is the target's range, course, and speed. TMA is done by marking from which direction the sound comes at different times, and comparing the motion with that of the operator's own ship. Changes in relative motion are analyzed using standard geometrical techniques along with some assumptions about limiting cases. Passive sonar is stealthy and very useful. However, it requires high-tech components (band-pass filters, receivers) and is costly. It is generally deployed on expensive ships in the form of arrays to enhance the detection. Surface ships use it to good effect; it is even better used by submarines, and it is also used by airplanes and helicopters, mostly to a "surprise effect," since submarines can hide under thermal layers. If a submarine captain believes he is alone, he may bring his boat closer to the surface and be easier to detect, or go deeper and faster, and thus make more sound. Modern torpedoes are generally fitted with an active/passive sonar. This may be used to home directly on the target, but wake following torpedoes are also used. An early example of an acoustic homer was the Mark 37 torpedo. Torpedo countermeasures can be towed or free. An early example was the German Sieglinde device while the Pillenwerfer was a chemical device. A widely used US device was the towed Nixie while MOSS submarine simulator was a free device. Mines (acoustic mines) may be fitted with a sonar to detect, localize, and recognize the required target. and An example is the CAPTOR mine. Mine Countermeasure (MCM) Sonar is a specialized type of sonar used for detecting small objects. Most MCM sonars are hull mounted but a few types are VDS design. An example of a hull mounted MCM sonar is the Type 2093 while the SSQ-32 mine hunting sonar is a VDS design. For many years, the United States operated a large set of passive sonar arrays at various points in the world's oceans, collectively called Sound Surveillance System (SOSUS) and later Integrated Undersea Surveillance System (IUSS). A similar system is believed to have been operated by the Soviet Union. As permanently mounted arrays in the deep ocean were utilized, they were in very quiet conditions so long ranges could be achieved. Signal processing was carried out using powerful computers ashore. With the ending of the Cold War a SOSUS array has been turned over to scientific use. Sonar can be used to detect frogmen and other scuba divers. This can be applicable around ships or at entrances to ports. Active sonar can also be used as a deterrent and/or disablement mechanism. One such device is the Cerebus system. Scuba diver using INSS hand-held sonar. This is a sonar designed to detect and locate transmissions from hostile active sonars. An example of this is the Type 2082 fitted on the Vanguard class submarines. Companies such as Marport Canada, Wesmar, Furuno, Krupp, and Simrad make a variety of sonar and acoustic instruments for the deep sea commercial fishing industry. For example, net sensors take various underwater measurements and transmit the information back to a receiver onboard a vessel. Each sensor is equipped with one or more acoustic transducers depending on its specific function. Data is transmitted from the sensors using wireless acoustic telemetry and is received by a hull mounted hydrophone. 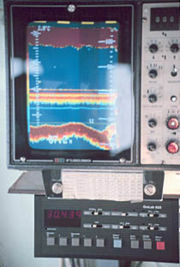 The analog signals are decoded and converted by a digital acoustic receiver into data which is transmitted to a bridge computer for graphical display on a high resolution monitor. An echo-sounder sends an acoustic pulse directly downwards to the seabed and records the returned echo. The sound pulse is generated by a transducer that emits an acoustic pulse and then “listens” for the return signal. The time for the signal to return is recorded and converted to a depth measurement by calculating the speed of sound in water. As the speed of sound in water is around 1,500 metres per second, the time interval, measured in milliseconds, between the pulse being transmitted and the echo being received, allows bottom depth and targets to be measured. Sonars have been developed for measuring a ship's velocity either relative to the water or to the bottom. Small sonars have been fitted to Remotely Operated Vehicles (ROV) and Unmanned Underwater Vehicles (UUV) to allow their operation in murky conditions. These sonars are used for looking ahead of the vehicle. The Long-Term Mine Reconnaisance System is an UUV for MCM purposes. Sonars which act as beacons are fitted to aircraft to allow their location in the event of a crash in the sea. Short and Long Baseline sonars may be used for carring out the location, such as LBL. Biomass estimation uses sonar to detect fish, etc. As the sound pulse travels through water it encounters objects that are of different density than the surrounding medium, such as fish, that reflect sound back toward the sound source. These echoes provide information on fish size, location, and abundance. Sonars have been developed that can be used to characterize the sea bottom into, for example, mud, sand, and gravel. Relatively simple sonars such as echo sounders can be promoted to seafloor classification systems via add-on modules, converting echo parameters into sediment type. Different algorithms exist, but they are all based on changes in the energy or shape of the reflected sounder pings. Side scan sonars can be used to derive maps of the topography of an area by moving the sonar across it just above the bottom. Low frequency sonars such as GLORIA have been used for continental shelf wide surveys while high frequency sonars are used for more detailed surveys of smaller areas. Further information is given in the article on side-scan sonar. Parametric sources utilize the non-linearity of water to generate the difference frequency between two high frequencies. A virtual end-fire array is formed. Such a projector has advantages of broad bandwidth, narrow beamwidth and no sidelobes. Its major disadvantage is very low efficiency of only a few percent.. In theory, a parametric receiver is possible but there is no known implementation. ↑ Mary Bellis History of Sonar. Inventors. About.com. Retrieved September 9, 2007. ↑ Security Through the Ages, CSO Online. Retrieved September 9, 2007. ↑ Intute Timeline - Inventions. Retrieved September 9, 2007. ↑ J. D. Perkins. 1999 The Rotary Bowcap. World War I Archives. Retrieved September 9, 2007. ↑ P.D. Jepson, et al. 2003. Gas-bubble lesions in stranded cetaceans. Nature 425:575. ↑ LFAS / Active Sonar In the News. Act Now for Ocean Natives. Retrieved September 9, 2007. ↑ Natural Resources Defense Council v. United States Navy. Retrieved September 9, 2007. ↑ Keith Lent. 2002. Very High Resolution Imaging Diver Held Sonar. Storming Media. Retrieved September 9, 2007. ↑ Kenneth L. Krueger. 2003. Diver Charting and Graphical Display. TEXAS UNIV AT AUSTIN APPLIED RESEARCH LABS. Retrieved September 9, 2007. Albers, V.M. 1967. Underwater Acoustics. University Park, PA: Penn State University Press. Fisheries Acoustics References Fisheries Acoustics Research (FAR) at University of Washington. Retrieved September 9, 2007. NOAA Protocols for Fisheries Acoustics Surveys. Retrieved September 9, 2007. ACOUSTICS IN FISHERIES AND AQUATIC ECOLOGY. Retrieved September 9, 2007. Hydroacoustic Protocol - Lakes, Reserviors and Lowland Rivers (for fish assessment). Retrieved September 9, 2007. Hackmann, Willem D. 1984. Seek & Strike: Sonar, Anti-submarine Warfare, and the Royal Navy, 1914-54. London, UK: HMSO. Hackmann, Willem D. 1986. Sonar Research and Naval Warfare 1914-1954: A Case Study of a Twentieth-Century Science. Historical Studies in the Physical and Biological Sciences 16(1):83-110. Urick, R.J. 1983. Principles of Underwater Sound. Los Altos, CA: Peninsula Publishing. ISBN 0932146627. This page was last modified on 11 October 2015, at 15:34.